Wednesday afternoon following practice Joe Salave'a talked with media about his defensive line group. All week long Mario Cristobal has preached playing 'physical' ahead of Utah. 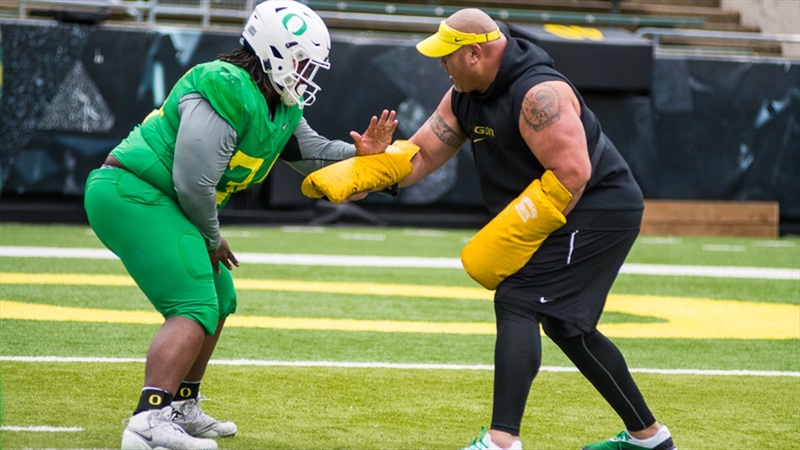 The defensive line is an important piece of the Oregon defense and its success. Getting this group ready to play is one of Oregon's top priorities. Joe Salave'a talked about this weeks prep and the test ahead in Salt Lake City. Below are the highlights from his interview as well as the video posted at the bottom. "The game will never change in that matter. The wrinkles as far as game-planning and scheme might vary. But when you peel this thing down it's all about football. It's all about toughness, physical play, through and through. So we're excited about the opportunity." "Attitude. The way we practice. How hard we run to get to the ball. And detail. That comes out in the execution. We're not all over the place. Being able to dial in on the job specs and everybody executing our calls and assignments goes a long ways with what we're trying to do. Physicality involves everyone doing their job and doing it well." "He's a tough runner. Everyone has to be in their area. Everyone has to dominate their space. We gotta go after it with a lot of hats. Those are the things you see in this conference throughout. A lot of elite athletes and their no difference this week. They're a good bunch and we got our work cut out for us. He runs runs runs hard. With his shoulders, with balance." "You gotta show up to play. It's never the best player on the team that wins, it's the team that plays the best. We gotta be hitting on all cylinders up front." "Just has a knack for the ball. He has a football IQ that's off the chart. we're just happy and excited for him."